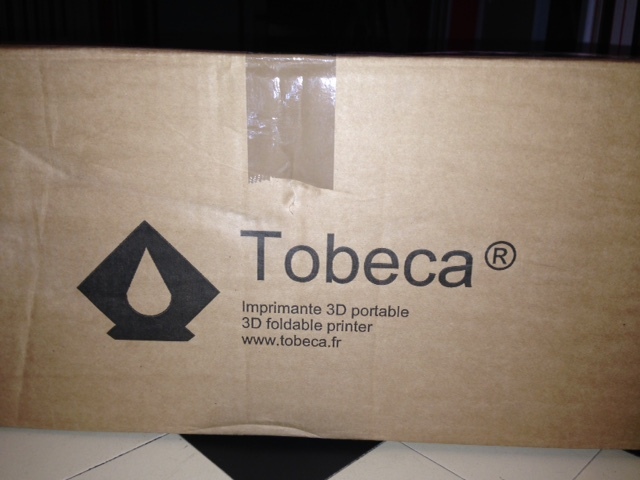 The Tobeca 2 is a French and Open Source 3dPrinter. THis printer is delivered in a kit (you can also ask to get it built for a higher price) The price of the printer is about 700€ + 100€ for the dual head option I chosen. So I’ll publish some post in the next days to detail the installation. My time is really short these week, so it could be long before I finish it. By-the-way if you have one to build of you want to buy one, I hope these notes based on my experience will help you. Finally, I spent about 16 hours to mount the printer and a couple more to get my first print! I just get it !! So everything starts on a morning of falls when the big box has been delivered by a postman. 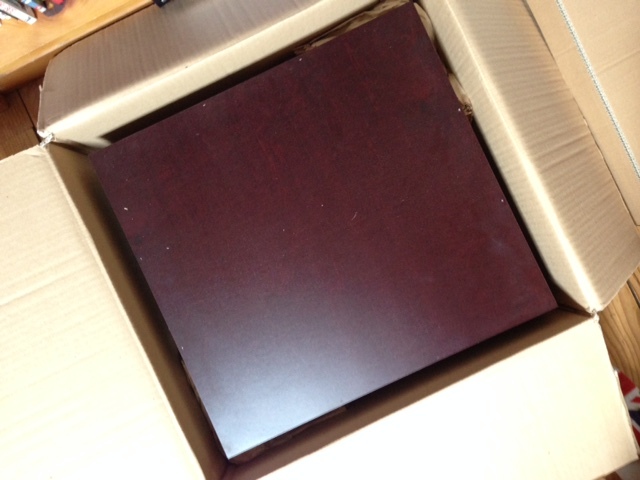 The first difficulty is to get this wood box out of the main box. Then you have to remove a brawn scotch – This one is not easy to remove. A better one would be appreciated. Ouf ! 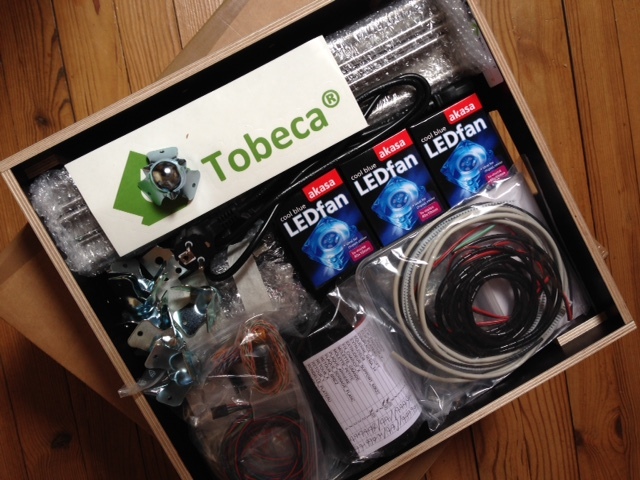 they are in the tobeca box in fact 🙂 so the delivery was completed correctly ! good. Everything is well packed. I was surprised to find no paper documentation in it. More over the CDROM with the documentation is in the middle of all the different parts so the first time you think to have to documentation to build it. Internet gives you a pdf but the first one is an obsolete one. 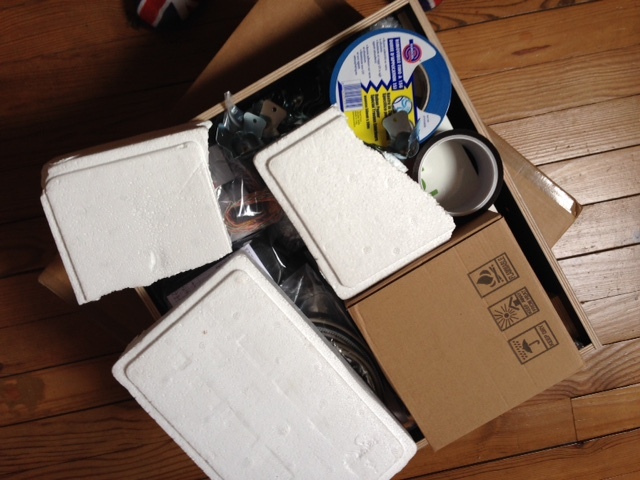 So the first step is to dig into the package to find the CD and put it in your PC to get the documentation. 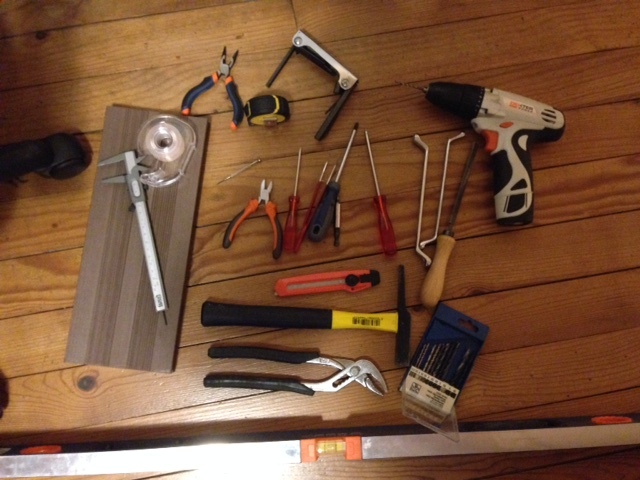 First step : getting all the tools you need to build the printer. If I could suggest some thing as the buid requires some unusual tool like Glue, abrasive paper and a tool for small screw, it could be really nice to have them included or as an option. The CDROM have a piece of paper on it so when you put it in the driver you get something like an helicopter running in your drive… could be avoided as it seems to really slow down the read of file. By-the-way, the documentation is really nice with many photo and good explanations including tips. Let’s start to build it now ! Some of the nuts are not usable ; it seems that we have more than needed. I hope. There are a lot of different screws and it is easy to make a mistake taking one instead of another … It would be really appreciated to have a small sticker on each bag with what is inside. On page 8, you have different type of M3 screw, some with rounded head and some other with plane head. The one to use here are the rounded head. Page 17, you have to plug a fan on the power-supply case. Apparently, you have to get the fan connector from the back side to the front side of the fan. For this, I recommend to move out the middle cable first, then the two others. Apparently, the screw is inside the power-supply box and the nuts are outside. Page 19, when you connect the external power supply, you are inverting phase and neutral after the switch. It it unclear why, and personally I did not invert them. Page 25, to strap the heating plate lane, I recommend to heat both pin put solder, then move your soldering tool up and continue to add solder on the PCB. It works well. Page 26, you have to solder the Thermistor, but the first challenge is to find it ! You have a plastic bag with metal stuff like spring and ball bearing. Here it is ! Page 28, You have to cut a 50cm cable from the Ethernet cable. As on next part you have to cut a 60cm one, I recommend to directly cut 60cm then to remove 10cm on the one you cut for the Thermistor. Page 30, you have to put scotch on the angle, I recommend to put some on the 4 angle, not only 2. I assume the varnish could be removed in time and you have a risk of electric conduction in my opinion. Page 35, the Nema17 motor seems to be the big one. The screw heads are really easy to destroy so, if you have some difficulties to remove one, try another. Page 37, the Y axe supports are the bigger one. The best way to enter the plastic parts in the axes is to screw them. Page 44, it was not possible to have two part or RETOUR608_ZZ aligned and not possible to easily have the screw passing through the hall. I had to enlarge the hole with a 3.5mm drill. Be carefull with the plastic piece, when clamping it, it started to be broken. Page 45, the 840mm strap is the longer one. Page 50, before mounting the heating panel, you can enlarge the screw hole a little bit as the one made are not allowing the pannel to easily move vertically. I did not do it but it could be a good idea. Be careful if enlarged too much you have a risk of horizontal instability. Page 67, the screw is really small and the nut have to be inside the plastic piece to fit. You can use a longer screw to move the nut on the bottom of the piece then change the screw. Or you can screw without the metal piece, then remove the screw and restart with the metal piece. Page 69, on the photo we see 4 slices, when the documentation says 2… I put 4. Page 74, here is the first time I really had an issue : with a dual head, the mount is not the same and you have the choice, regarding the photo, you will have the cable on the opposite side or the linear guide on the opposite side. I have chosen for the linear guide, I hope I did well because, even if the first time I mounted it the other side I had no issues, when I tried to unmount to revert, it was not possible to remove all the metal stem. When mounted it again, it was not possible to fit the stem into the metal peaces I had to use a hammer and for will i’ll never to able to unmount them again. 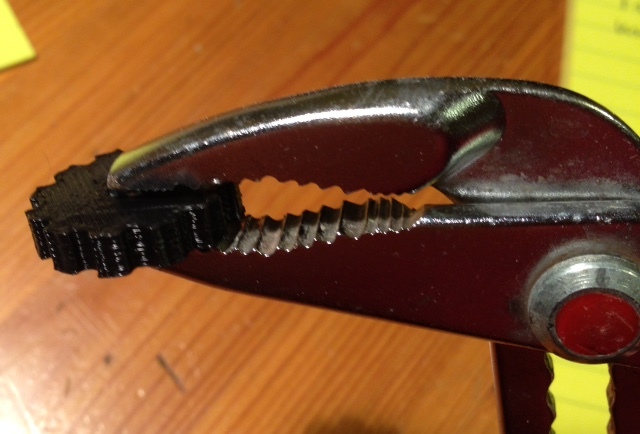 Page 78, the plastic clamp have to be on the opposite of the heating head or you won’t have enough space. Page82, the more efficient way is to make 3 turns in 1 time with the scotch, then cut it. Page 89, I assume the guy writing the documentation was bored about details… since 2-3 pages you have missing information about what screw to use… here you don’t know what you have to put on the right and left side … Don’t forget to use the PLAQUE_SERRAGE_FLANC, they are not visible on the photo! The motor electrical connector have to be on the opposite of the power supply. If like me, you have 2 motors with different cable end (one white and one black) I recommend to put the white one on the right side (Y motor in front of you). Later when you will have to plug it on the driver, you will only be able to connect it on the right connector. Page 92, another, more easy to mount the X axis on the top is to remove the filtered stem from the motor et strew it on the X axis. Then plug it again on the motor. Page 96, it is requested to cut a 1.2m long cable from the ethernet cable. But as I already cut a 50 and 60 cm … now I only have a 90cm one … hope it will be enough. Page 102 : take a look to page 119 to do the work at this step, it will be less rework later. Page 119 : this page should be on the first steps when you have less cable in the middle and it would be easier to add the fan cables. Page 120 : when you copy the Marlin Arduino project on a MacOsX filesystem, all the files are readonly. You have to add chmod a+w on the files and also on the directory itself, otherwise you can’t compile. For the heater cables for exemple, they have to pass on the top of the head, not the bottom. On this photo you can seet wo things : my cables are passing on the wrong side : they are supposed to com behind the left arm, not in front like here. 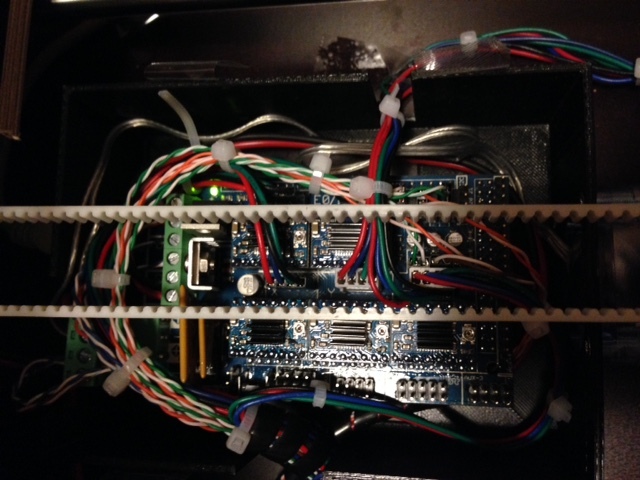 You can also see that I had a lot of extra cables, so potentially it would be good to mark each cable, to pass it correctly and THEN put the connector at its end and plug it. This could avoid part of this, even if the main part is motor cables that are already connected. I did not had big issues with the software, once connected to the printer you can move every axes and heat whatever you want to ensure everything works well. The main issue I had with the first print was to load the PLA into the heater: the eater hole is not exactly in front of the PLA arrival and just can’t put it in. 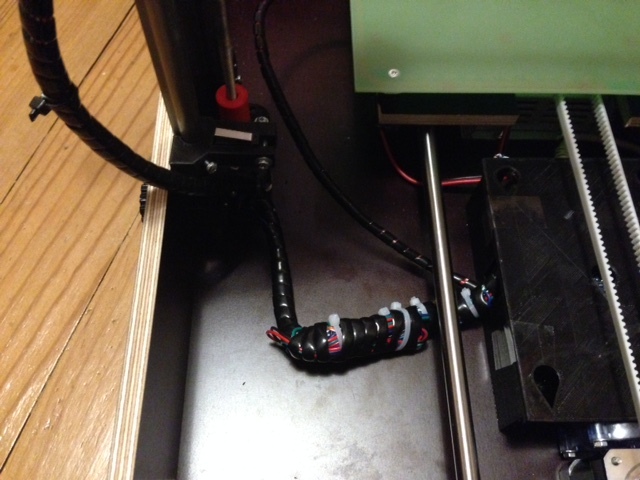 The solution I found was to bend the PLA on the internal side of the heater to have it going the right way. From the forum I got an extra part to avoid this issue. I’ll try to print it soon. So after this problem, It works ! 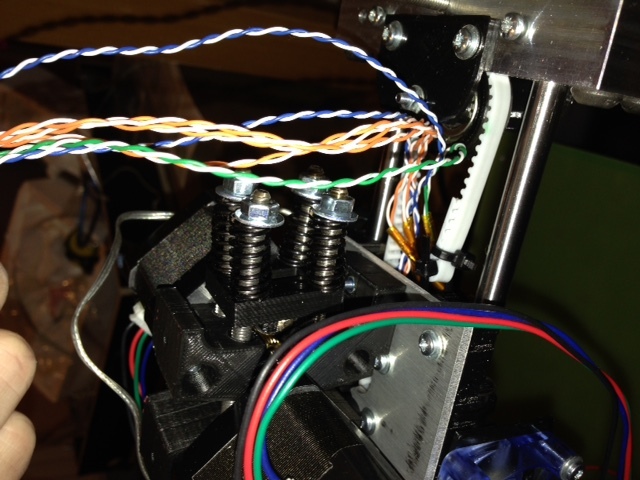 This entry was posted in 3D printing and tagged 3dprinting, tobeca. Bookmark the permalink.